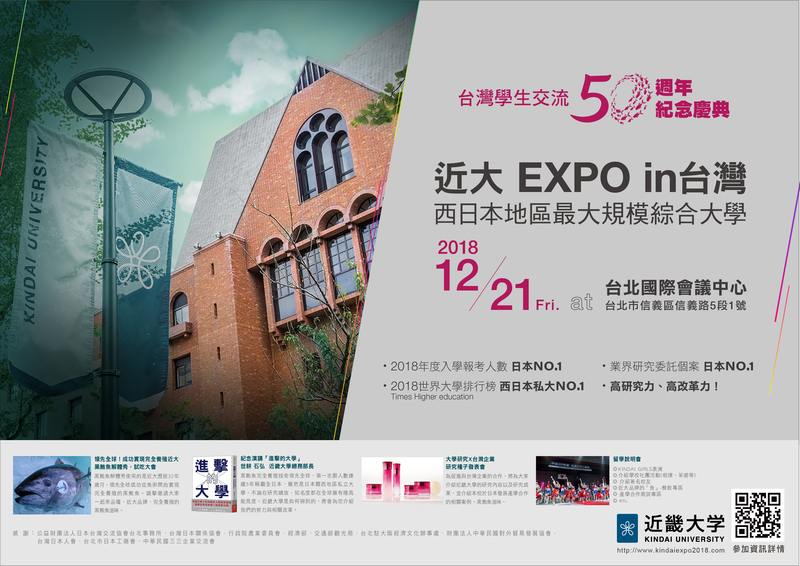 Kindai University, based in Higashiosaka City, Osaka Prefecture, Japan, will hold “Kindai EXPO in Taiwan” at the Taipei International Convention Center on Dec. 21 (Friday), 2018, as an event to mark the 50th anniversary of the start of its student exchanges with Taiwan and deepen friendly relations further through exchanges with Taiwan’s universities and companies. - It will showcase Kindai’s latest research at a business forum and a workshop on research seeds. Kinki Univervsity will hold an event aimed at further deepening friendly relations through exchanges with Taiwan’s universities and companies in commemoration of the 50th anniversary of Kindai starting exchanges with Taiwan. Kindai started exchanging with Taiwan through its Correspondence Division in 1968. Even though diplomatic relations between Japan and Taiwan were severed in 1972, Kindai has been building close relations with Taiwan by resuming accepting students in 1973 and providing schooling on the sea in Taiwan, among other efforts. Kindai has continued to exchange with Taiwan and accepted 1,680 students from the island so far as it concluded agreements with Taiwan’s universities and so forth in recent years. On the day of the event, a total of 300 people, including graduates, enrolled students and staff from Japan, Mainland China and the U.S., will converge in Taiwan to pump up the event. Apart from a filleting display and tasting of “Kindai Tuna,” the bluefin tuna that Kindai has successfully farm-raised for the first time in the world, there will be must-attend programs for businesspeople such as a speech by Kindai University General Affairs Director Ishihiro Seko, known for his book titled “Shingekiteki Daigaku (Aggressive University), and a workshop on research seeds. Among other programs are e-sports competitions involving Naoki Sugimura, a Kindai student who represented Japan in sports video game "Winning Eleven 2018” and won the gold medal at the Asian Games, as well as a counseling booth for foreign students and a program for introducing school clubs. Furthermore, “KINDAI GIRLS,” a performance unit for Kindai’s entrance ceremony produced by Tsunku, a former producer for all-girl group Morning Musume, will put on spectacular performances. There will be plenty of other programs, including a booth for Japanese cuisine and a raffle draw. Kindai University’s latest research to be announced. There will be an exhibition booth for industry-academia collaboration products. Please feel free to use the images on the project provided on the following website. “Manzai Bonbon” (C) YOSHIMOTO KOGYO CO., LTD.